The introduction of a new 2012 Mustang Boss 302, could be just the news you've wanted to hear if you've always wished you could have had an original. It's based on the new 5.0 liter V8 and returns to the streets and the track with a vengeance! But is this just a styling package for the 2012 Mustang? Absolutely not. The Boss Mustang is a revered name even at Ford and the engineering team thought long and hard about how to properly recreate a legend, with all the advantages of modern technology and that sweet new 5 liter engine. The 2012 Mustang Boss 302 is designed to be something special,which means unlike, say a Roush Mustang, you can't just go to Ford Racing and plunk down a list of parts and convert your 2011 Mustang or 2012 Mustang to a Boss 302. Creating a distinctive shape and engineering the car for superior aerodynamics were the goals for the new Mustang Boss. 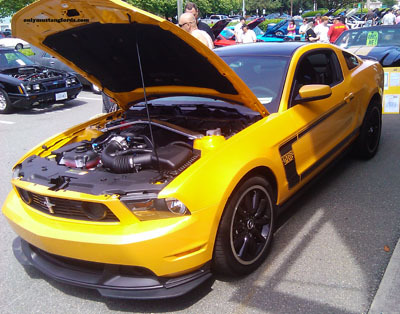 Here's a new Boss 302 at the 2011 Sounds of Summer Mustang show in Coquitlam BC (near Vancouver). From the front, you notice the unique front fascia, blocked off fog light holes and an aggressive spoiler/splitter a-la original boss Mustang. The intent was to manage the air under and into the car to enhance aerodynamics and improve cooling to the engine and brakes. 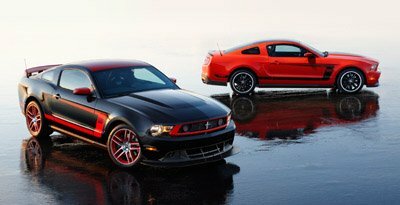 There are actually two distinct incarnations of the 2012 Mustang Boss 302. The first, is what you might think of as the street Boss Mustang, while the second, known as the Boss 302 Laguna Seca, takes the race bred treatment even further, both, as a tribute to the original Parnelli Jones win in a 1969 Boss 302 in the 1970 Trans-Am season opener and unveiling what might just become a great showroom stock entry for some lucky owners. A special stripe treatment, reminiscent of the 1969 Boss has been added to enhance the family resemblance as has the addition of a flat black or white hood and roof treatment, depending on the side stripe color. 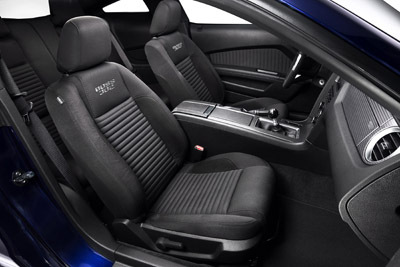 Adding to Ford's already superb fit and finish is the addition of some very tasty contoured seats and a sophisticated looking interior. The seats have a kind of updated/retro Mach l look. These cars have really moved up level in the interior department since the initial rental car looking interiors in 2005. Along with a standard console shift, there's a new version of the gauge pod or rally pack mounted at the top of the dash. You just had to know that they could get more horsepower out of that beautiful new 5.0 Mustang engine and of course they did. Using good Old Skool hot rod technology, they added a lumpier cam, improved the breathing in the heads and added a bigger and pretty unique new 4 pipe exhaust. 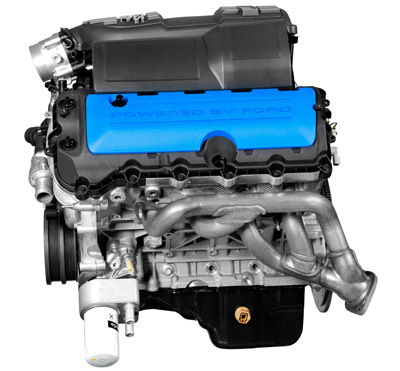 For added success on the track, a new intake was designed for better power in the upper rpm ranges. 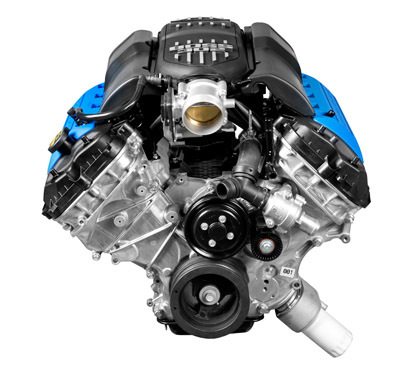 The end result, is an output of 440 horsepower at 380 pounds of torque, while still offering a smooth idle. Couple that to a close ratio six speed manual transmission and a heavy duty clutch and that new short throw shifter makes mincemeat out of the road. 2012 Boss Laguna Seca model. More information on the new Boss is added as Ford releases it, so stay tuned. Boss Track Key - Try the Red One ! Two heads are better than one, when you can operate the stock 2012 Boss (if you can call any Boss Mustang stock..) with one key or insert a special Red Track Key which unlocks the full Boss 302R race computer and see how it transforms all aspects of this car into a beast! Want to learn how to safely get the most out of your Boss 302 on the track? Then the Boss Track Attack is the way to do it. Check out the link and what your pony is capable of. Looking to see the ferocious Boss 302 in action? Check out the 2012 Boss 302 video section. Check out it's debut at the international auto show and see the 2012 boss 302 in Vancouver , BC. And finally (well, for now anyways) check out the development of the Boss Mustang, from it's under cover race track testing and tuning from a very interesting story of the 2012 Mustang Boss 302 on Speed Channel.